When the bird dies, we restart the game right away. Instead, we are going to make the bird fall off the screen as a dead animation. 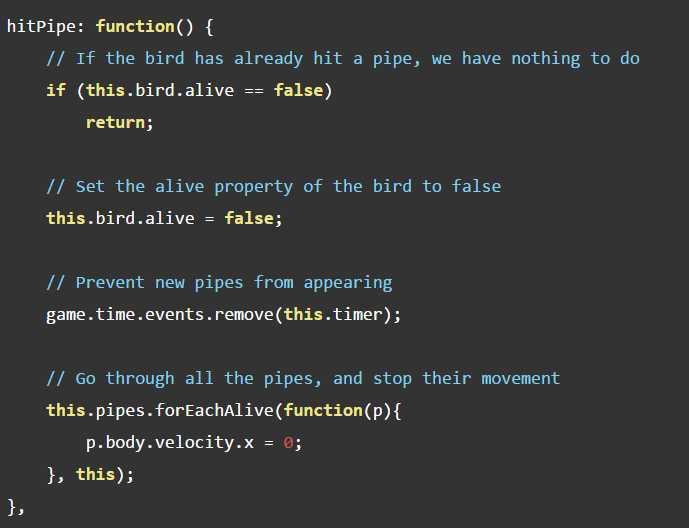 First, we update this line of code in the update() function to call hitPipe() instead of restartGame() when the bird hit a pipe. Now we create the new hitPipe() function. Last thing, we don't want to be able to make the bird jump when it's dead. So we change the jump() function by adding this two lines at the beginning.